Bandai Godzilla 1964, Side (1984) | Flickr - Photo Sharing! The Bandai Godzilla '64, or Mosu-Goji, was first issued in 1984. A second release followed in 1988 and a third in 1989. The above is the first, '84 release. 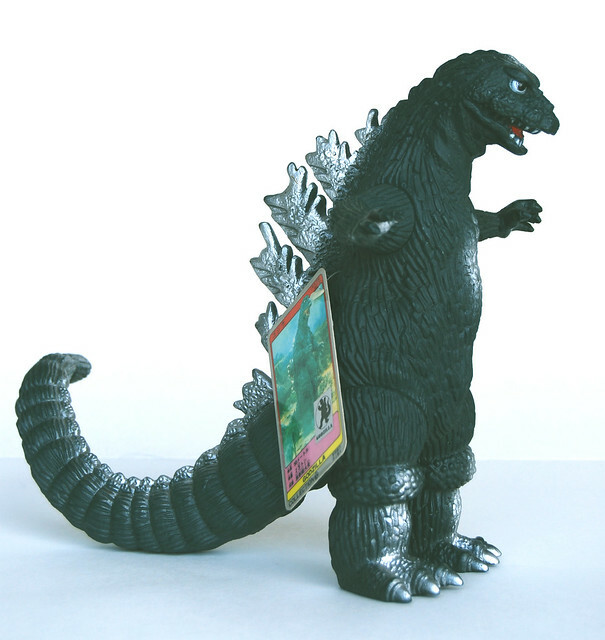 The 1984 issuing is dark green and has a hard cardboard tag, commonly called a "plastic tag" or "hard tag", while the 1989 issue is darker, with more silver highlights and a lighter cardboard tag such as those common to most bandai figures. The fins of the Mosu-Goji figure were pressed into the vinyl, but not cut out all the way, as can be seen on this side view. The fins did stay virtually the same in both releases, unlike the Godzilla 62, whos fins got smaller from the first issue to the Godzilla Forever to the Memorial Box.